Meredith TenHoor, Class of '94, is an Associate Professor at Pratt Institute's School of Architecture. She is an architectural historian whose research examines how architecture, urbanism and landscape design participate in the distribution of resources, and how these design practices have produced understandings of the limits and capacities of our bodies. This academic year, TenHoor is on leave from Pratt as a Fellow in Princeton University's Princeton-Mellon Initiative in Architecture, Urbanism and the Humanities. Her primary focus is to complete a book about the modernization of food systems in 20th-century France. She is organizing a colloquium in the spring focused on theories of infrastructure developed by activists, architects, social psychologists in France in the 1960s and 70s. She is also working on an "activist history project" on the recent history of toxic building materials, working collaboratively with an architectural historian, Laura Diamond Dixit, to "make architects more aware of the ecological and social impacts of using materials that often have invisible forms of toxicity." TenHoor began her career in architecture at Princeton, where she enrolled in graduate school after several years working as a software architect/interface designer in the dot-com boom of the late 90s and early 00s. Outside of her software job, TenHoor was interested in the societal impacts of technological change, and in her spare time she was making documentaries about urban change. She felt that software designers were not critical or informed enough about the ways their work would be used, and decided to pursue academic work which would allow her to research and write about these issues. As she began her studies in the history of architecture at Princeton, she "loved it and found it fascinating, especially the history of architectural history, because of its long history of theorizing on the relationships between design and use." Even as an undergraduate, TenHoor had done a lot of writing about food and food consumption; she also had been interested in French critical theory by thinkers like Michel Foucalt, Jacque Derrida, Félix Guattari, and Gilles Deleuze, who had been writing about networks in society. Early in her graduate coursework, TenHoor realized that she could connect the history of this theory and the history of physical networks, and focused her research on networks for distributing food. Her dissertation addressed the Marché d’Intérêt National de Paris-Rungis, the world’s largest wholesale food market, which was built in the suburbs of Paris in the late 1960s after the modernization and closing of the largest market in central Paris at Les Halles. "Unlike in the U.S., it is an incredibly powerful central node in the food supply. If you eat in a restaurant or buy food from anywhere but the largest grocery chains in Paris, chances are your food has passed through Rungis." TenHoor began teaching at Pratt part-time while completing her dissertation research, and took a full-time position in 2012. At Pratt, she coordinates a team of fourteen faculty members who teach undergraduate architectural history and theory. Teaching architectural history is a requirement for accreditation in schools of architecture, and TenHoor sees this as a great strength of architectural education, especially in comparison to the software and technology industry where she previously worked. She believes that teaching history and theory enables students "to think about the ethics of what they're making" and to "understand the history of their discipline," which "allows for more creative and well thought-out designs" than you would see in other disciplines. In her time at Pratt, TenHoor has also worked to diversify the curriculum to make it "less Euro-centric and more globally focused, addressing the systematic exclusion of women and people of color from the way that architectural history was traditionally taught in the U.S."
While completing her PhD, TenHoor took an interest in Fulton Street in Brooklyn, a shopping district popular with many Caribbean-American and African-American shoppers and businesses that was re-zoned by New York City in 2004 to allow for denser development. Although this was ostensibly for the economic benefit of the city, TenHoor and her collaborators found that one of the underlying forces driving the re-zoning was a mistaken belief that spaces that attracted non-white shoppers had to be "improved" or "modernized" in order to be valued by investors, real estate interests, and city officials. TenHoor joined Rosten Woo, Adam Michaels, and Damon Rich to organize an exhibition on the history of the Mall. 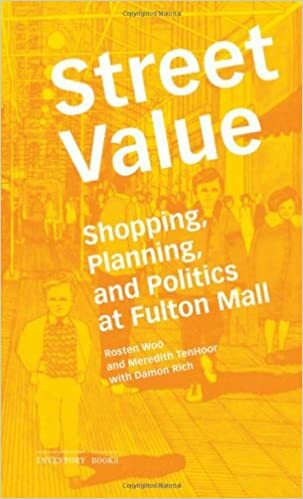 Then TenHoor and Woo expanded their research in a book, Street Value: Shopping, Planning, and Politics at Fulton Mall. In 2006, TenHoor was one of the founders of the Aggregate Architectural History Collective, which was started by a group of architectural historians who "no longer wanted to work in isolation." The Aggregate group meets regularly to discuss and critique work, in a process they call "transparent peer review," sharing comments and criticism face-to-face, in contrast to the blind system of traditional peer review. In 2012, Aggregate incorporated as a 501(c)(3) and published Governing by Design: Architecture, Economy, and Politics in the Twentieth Century. They sponsor and publish open-access research on their website, we-aggregate.org. In March 2015, Aggregate collected and published a collection of essays under the title, Black Lives Matter, which "put Black lives at the center of our thinking about architecture and its history." TenHoor had been involved in Black Lives Matter protests, and in January 2015, along with her colleague Jonathan Massey put out a call for architectural history works that could respond to the issues raised by Black Lives Matter activists, and "would take seriously the ways that architectural history might change in response to activist demands, and at the same time put insights from architectural and urban history in the hands of activists and educators." Massey and TenHoor edited the submissions over a few months to publish the collection in a short timeframe. The collection is the most widely-read publication from Aggregate, and TenHoor has been happy to see that its texts are widely used in teaching. When looking back on her high school education, TenHoor says: "The Magnet taught me how to work in a very disciplined way - those nights when I had to stay up until 2am and wake up again at 6am - I don't think anyone should have to function on so little sleep but I still use that in a sense, that kind of discipline and stamina." The most influential class she remembers from Blair were "Mary Bloom's art classes . . . , [which] taught me how to observe things carefully, not just visually but also socially, and to start a long-term investigation and see it through." TenHoor also remembers that "Mr. Donaldson's Origins of Science class really sparked my imagination - I hadn't been that interested in history previously, but realizing the way in which science was embedded in culture and being able to do experiments from the ground up was an incredible model of experiential learning for me." Overall, TenHoor says she "loved the culture of curiosity in the Magnet," and "realizing that life could be about the fulfillment of one's curiosity."